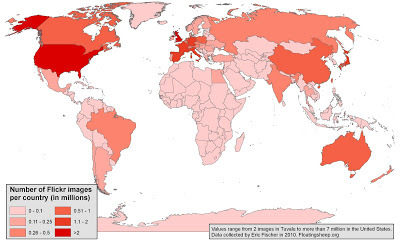 Today’s map is a visualisation of all 34 million geotagged Flickr images. The data were kindly collected by Eric Fischer and then aggregated to the country-level (an operation that took our computer about three weeks to process!). You can see that user-generated images in Flickr display similar geographies to other types of user-generated content (e.g. Wikipedia). In the next few weeks, we’ll upload some variations of this map. These results aren’t necessarily surprising, but do just reinforce findings that subjects of user-generated content are highly concentrated in only a few parts of the world. Note: This post was originally published on the Floating Sheep blog on 26 July 2010 3:30 pm . It might have been updated since then in its original location. The post gives the views of the author(s), and not necessarily the position of the Oxford Internet Institute.